Meet the newest member of the Nature’s Sleep family of mattresses. The Emerald gel memory foam mattress is a unique mattress designed specifically for stomach sleepers. The foam layers and construction help to provide an optimal sleeping experience for stomach sleepers, improving spinal alignment, and reducing pressure on the sleeper’s breathing. The ground breaking design of the Emerald gel mattress is a final contestant in INC magazine’s 2015 Best in Class Design Award contest. 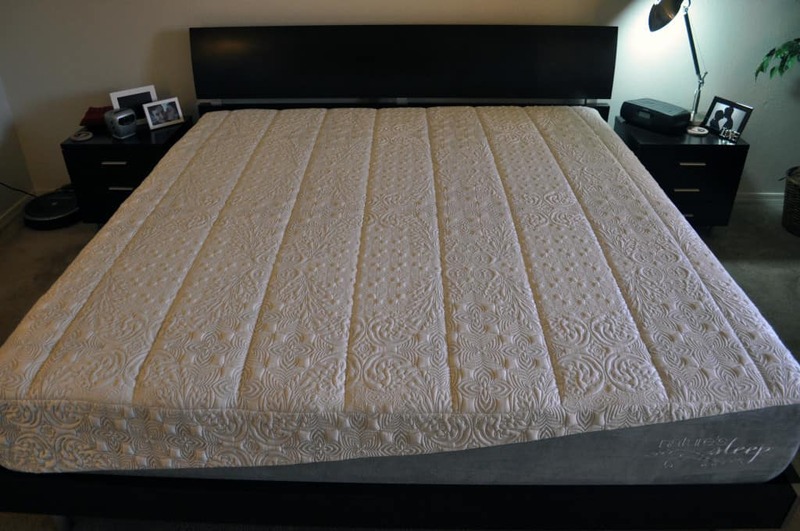 Continue below for our full review of the Nature’s Sleep Emerald gel memory foam mattress. In a rush? Click here to jump to the review summary for the quick version. The Emerald gel memory foam mattress is built from 4 different layers of foam. This mattress is 12″, which is a bit thicker than the standard 10″ mattress you see a lot of. The extra thickness helps to improve durability, better handle weight distribution, and minimize motion transfer. The top layer is 1.0″ of visco memory foam. 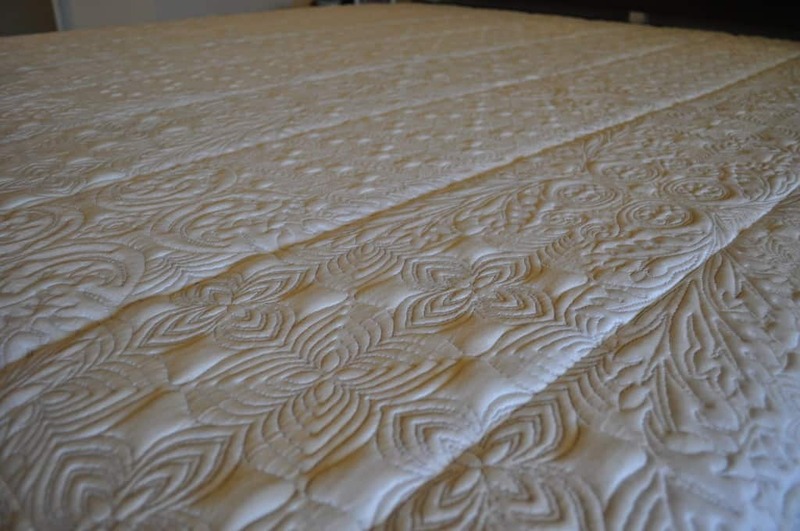 This layer is part of a quilted top layer aimed to providing amazing comfort and softness. The top layer is the most reactive layer (adjusts with you as you move during your sleep) and the most temperature sensitive layer. The second layer is 2.0″ of SGT (superior gel technology) memory foam. This gel layer helps keep the mattress cool by pulling heat away from the top layer and expelling it through the sides and bottom of the mattress. Additionally, this layer acts as both a hybrid comfort and support layer. The foam’s density is such that you neither sink too deeply or not deep enough. It’s a “just right” type of a feel and sinkage. The third layer is 1.0″ of Vitex memory foam. Vitex memory foam is a custom foam created for and by Nature’s Sleep. It has many of the same benefits of traditional memory foam, including amazing support and great pressure relief, but in addition it is a bit more responsive. The increase response time helps it to more quickly adjust to your new positions as you move around during the night. Both the gel layer and Vitex layer help to provide great deep compression support and pressure relief. The primary responsibility of the 3rd layer is support. Additionally, it is responsible for the “elevator effect” that really makes this mattress work for stomach sleepers (see the Firmness, Support, & Comfort section below for more on the “elevator effect”). The fourth and bottom layer is 8″ of high-density support foam. This layer acts as a strong foundation for the mattress, supports the 3 top layers, and remains breathable to help cool the mattress. The cover has a nice two-tone angular design along the perimeter. The white portion of the cover is a viscose / poly / spandex blend. The grey portion around the perimeter is micro-suede, which has a really nice texture and contrasts beautifully with the white. The cover is thin, but has a certain weight and strength that communicates its quality. Additionally, it has been designed to allow air to flow around the sleeper, helping to reduce surface level temperatures. The cover can be removed for spot cleaning, but it is not machine washable. Additionally, the embroidered cover is allergen-resistant and anti-microbial. The Nature’s Sleep Emerald gel memory foam mattress behaves similar to most memory foam mattresses in terms of firmness and feel. The initial firmness will depend largely on the ambient temperature of the room. If it’s colder it’ll be firmer, if it’s warmer it’ll be softer. Additionally, as you lie on the mattress it will begin to soften up as your body heat penetrates the layers. When you first lie on the mattress it’s fairly firm (this is at a room temperature of 80 degrees), at a 7.5 out of 10 on the firmness scale (where 10 is the most firm). However, this quickly softens up as you lie. After a few seconds the foam layers begin to conform to your body and the softness engages. After 10-15 seconds it reaches the balanced point and sits at a 6 out of 10 on the firmness scale. This is where it will sleep most of the night. I will admit, when I first laid on this mattress I was prepared for disappointment. I really do not like many memory foam mattresses. It’s a personal preference, but I don’t like the sensation or feel of the mattress hugging and conforming to my body. It generally makes me feel a bit trapped down within the mattress. However, I found the Emerald gel mattress’ hug sensation to be quire nice. When you lie on this mattress you’ll definitely feel that contouring. The memory and other foams within the mattress hug and support your unique shape. However, the Emerald gel memory foam mattress goes well beyond that. The foams have been layered within the mattress to provide an “elevator effect”. Essentially, the foams allow you to sink more deeply or shallowly into the mattress depending on your body position and weight. Each layer has a very specific thickness and construction. The layers work both independently and in conjunction with each other. When you first lay down, your body will apply pressure on the mattress, sinking into the foams. At the same time the supporting layers are moving upward until they sense resistance. This results in an optimal sleeping position for stomach sleepers, helping to bring your spine into alignment and alleviate pressure. As a life long stomach sleeper I can say with authority and this is truly a unique sleeping experience for any stomach sleeper. Any stomach sleeper knows the feeling of comfort when wrapping your arms around your favorite flat pillow. Now imagine that sensation for your entire body, that’s the Emerald gel mattress. This mattress has an almost surreal way of providing support and comfort. In addition to helping bring your spine into alignment, the mattress also removes some of the pressure on your internal organs and reduces pressure on your breathing. In terms of heat and cooling the Emerald gel memory foam mattress does a pretty good job. Most memory foam mattresses have a tendency to sleep extremely hot. While this mattress doesn’t sleep quite as cool as some other latex or hybrid mattresses I’ve slept on, overall it does a good job minimizing heat and keeping the surface level cool. It sleeps just a touch hotter than the coolest hybrid mattress I have tested. 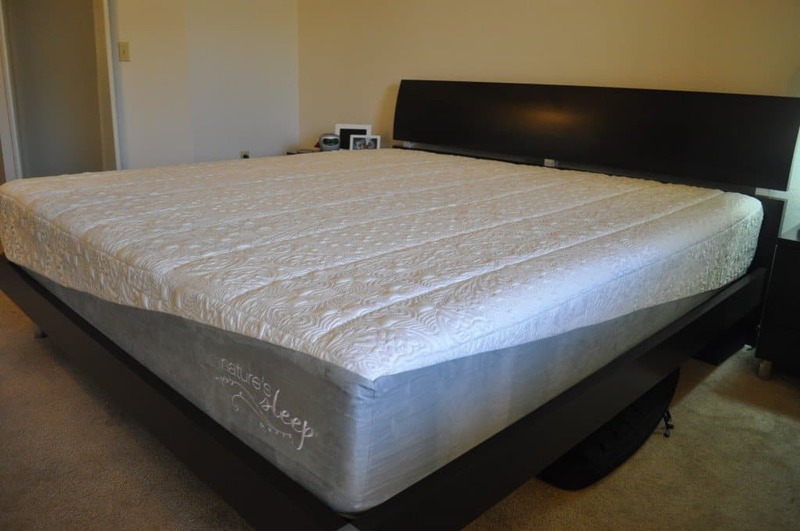 On all Sleepopolis mattress reviews we look at 3 different areas to gauge sinkage. Typical lying down position, edge support, and standing in the middle. Typical lying down position – in a normal lying position I saw 1-1.5 inches of sinkage (note: I am 145 pounds). Edge support – In a more conservative and normal sitting position I only saw about 2.5 inches of sinkage (in this position I am sitting further back on the mattress). When I moved to the absolute edge there was 4.5 inches of sinkage. Edge support is always difficult for foam mattresses of any variety. While the edges aren’t the best for sitting, they do a good job in a normal lying position and when getting out of bed. Some foam mattress can feel like they are ejecting you from the mattress as you get up. This certainly wasn’t the case with the Emerald memory foam mattress. Standing in the middle – while this test isn’t really indicative of normal use, I like to run this one to show how it performs under maximum pressure. For this test I only saw 5 inches of sinkage, which is pretty typical for a foam mattress. Most of the foam mattresses I test sink 4.5-5 inches for this test. Overall, the Nature’s Sleep emerald gel memory foam mattress is similar in terms of absolute sinkage to many other mattresses I have reviewed. However, as it is a 12″ mattress the total percentage of sinkage is lower in all 3 of these testing areas when compared to many 10″ mattresses. If you find that you sink too deeply with a standard 10″ mattress, the 12″ option can provide additional carrying capacity and improve the feel, comfort, and support. In terms of motion transfer, the Nature’s Sleep is solid. Memory foam just does a great job of minimizing motion from movement during the night. During my test I never felt my wife move. See the full pricing breakdown for the 4 available sizes for the Emerald gel memory foam mattress below. Prices within the parenthesis indicate the final price including the exclusive Sleepopolis discount. Shipping – comes to your door compressed and wrapped in plastic, shipping is free. Nature’s Sleep has warehouses all over the country, allowing them to ship to your house in 1-3 business days anywhere in the US. Trial Period – unfortunately, Nature’s Sleep does not offer a trial period. If you live near a Costco or Khol’s you may be able to try it if they have this model in store. Should you buy an Emerald Gel Memory Foam Mattress? 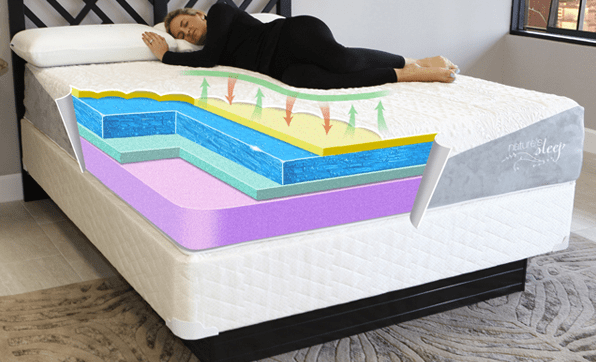 You’re a stomach sleeper or you have partner who is a stomach sleeper – while this mattress is designed specifically for stomach sleepers, it’s certainly not bad for side or back sleepers. My wife sleeps on her back and side and has enjoyed this mattress almost as much as I have. Click here to shop for the Emerald Gel Memory Foam mattress. The Nature’s Sleep Emerald gel memory foam mattress is a saving grace for stomach sleepers everywhere. Its unique construction and layering of varying foams help stomach sleepers find proper spinal alignment, while reducing pressure on internal organs and breathing. It uses high quality materials, resulting in great comfort, support, and good cooling. While it’s designed for stomach sleepers, it still is a good option for other sleeping styles also. Overall, an amazing option for stomach sleepers and a pretty good fit for others as well.